In recent memory, the city of Chicago had a slogan that was plastered all over town. You would see it in campaign ads, hear it on the radio, see it written in the newspaper and talked about in City Hall. 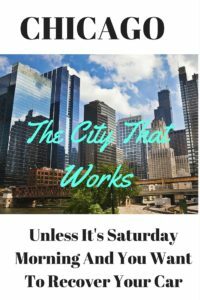 Chicago was declared the “city that worked.” It was the model case, the shining example of a city that other cities should emulate because it worked. I’m not so certain that the slogan holds any real value today. This is especially true if you are someone trying to recover your impounded vehicle and you are standing before a supervisor at 400 W. Superior during their normal Saturday hours of 8:30 AM to 3:30 PM. This was the case this past Saturday for one of my clients desperately trying to recover her vehicle. Under Chapter 13 bankruptcy law, the process is relatively simple. When a case is filed, the law firm receives a chapter 13 bankruptcy case number, a trustee assignment, a scheduled meeting of creditors date and time stamped proof or verification of the filing. The law firm then takes the extra steps to fax proof of the chapter 13 bankruptcy filing to the city of Chicago, to the city’s attorney, Arnold Scott Harris, as well as a telephone call to the law firm’s bankruptcy hotline. We then fax or email proof of the filing along with corresponding documentation to our client. This was all done late in the afternoon on Friday, June 24. At that time, the city of Chicago’s office was properly closed since it was after 4:30 PM. However, that office reopened at 8:30 AM the following day which was a Saturday. Unfortunately, my client was not given the proper assistance from a supervisor of the city that works. In my opinion, this is clearly a violation of the automatic stay in bankruptcy. Let’s examine the facts: A Chapter 13 bankruptcy case was filed on Friday afternoon, albeit late in the afternoon. Notice of the bankruptcy filing was faxed to both the city and the city’s attorney and a phone call was placed with the city attorney’s hotline. The following day, the debtor went to the city of Chicago which was open that morning, which was a Saturday, in an effort to recover her vehicle. The debtor was refused her vehicle because the supervisor had not yet received an approval or authorization from the city’s attorney. Based upon these facts, I clearly see a violation of the automatic stay. Let me give you a similar example where we would clearly say there’s a violation. In this example, a person files bankruptcy and notices are sent to the payroll department to stop the garnishment. If the employer or the payroll department refuses to stop the garnishment until such time as they hear from their attorney, and continue to deduct, then we have a stay violation. In our current case, it is not the debtor’s fault that the city of Chicago, which is open on Saturday morning, cannot access its counsel. In fact, maybe the city should have counsel that is available for these types of situations on Saturday mornings. After all, this is the only law firm that deals with bankruptcy issues with regard to the city of Chicago and parking tickets. Wouldn’t it make sense for that law firm to be available or at least on call for somebody trying to recover their vehicle after a bankruptcy case has been filed? I have yet to determine whether or not I will bring a motion for sanctions due to this knowing violation of the automatic stay by the city of Chicago. In conclusion, the city of Chicago doesn’t always work, even during normal working hours. If a representative or an attorney from Arnold Scott Harris would have been available on Saturday morning while the city was open, my client would not have been deprived of her property for the entire weekend and she would not have had to miss a portion of her workday on Monday trying to take care of what should’ve been taken care of on Saturday morning.